6) If, according to Infowars.com, Ron Paul was “America’s last hope,” why is the Alex Jones operation still in business, bigger than ever? 8) Still don’t think Alex Jones is gatekeeping for the Zionists? 9) If Alex Jones is such a threat to the NWO, why is he so sure: “I’ll be here in 20 years”? On the August 12, 2012 episode of Deconstructions Live, host Mike Sledge revealed (at 26:18) that there are three megachurches in his town in the Southern United States that have an Israeli flag behind the pulpit, next to an American flag. I previously wrote the article, Still don’t think Zionists run America? If you still don’t think they do after hearing this, I don’t know if anything more will convince you otherwise. And the alternative media? “America’s most listened-to late night talk show,” Coast to Coast AM, a supposed alternative show, continues to gatekeep Zionism, as I described in my article, Coast to Coast AM smears Islam, stays silent on Zionism. It shouldn’t come as any surprise, then, as to why staunch anti-Zionist, Stephen Lendman, hasn’t appeared on Coast to Coast AM. For a short explanation of why it is audacious apostasy, the late John Anderson, host of the Voice of Reason and bible-believing Christian, pointed out so eloquently at times during his lengthy radio tenure that the Old Testament prophecies and promises concerning Israel were to the House of Israel (now Christians), and not to the House of Judah, of which Jews are from. Prior to the influence of Cyrus I. Scofield in the 1800s and early 1900s, and his dispensationalist teachings, most evangelical Christians in the United States would’ve recognized it as apostasy as well. 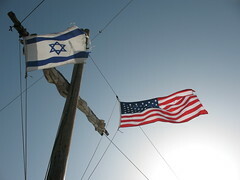 For a critical secular examination of whether Israel is the best friend of the United States, see my article, Fact check: Israeli Prime Minister Benjamin Netanyahu’s claim that America has no better friend than Israel.